The Town of Windsor is soon to be graced by a very rare event indeed – Sonoma County’s first grandmaster chess invitational, pitting together two world-famous chess players, Akobian and Petrosian. As of April, there are about 1,500 grandmasters in the world. Varuzhan Akobian, 32, and Tigran L. Petrosian, 31, both hail from Armenia, and Akobian now lives in Los Angeles. 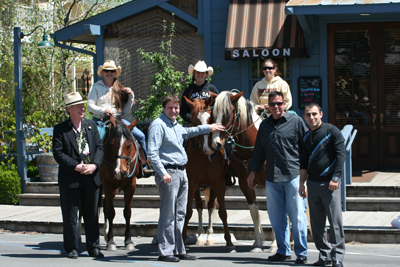 They will face off in a series of six bouts and participate in other facets of the event, which runs from June 7 – 10. The match is officially sanctioned by the U.S. Chess Federation and FIDE, the world chess federation. Akobian was the fifth highest rated player in the U.S. in May 2014, with a FIDE ranking of 2615. Petrosian was named after grandmaster Tigran V. Petrosian, the first Armenian to become World Champion. His FIDE rating is 2611. They will play six regulation games – two on Tuesday, two on Wednesday and two on Thursday, with the morning games taking place 10 a.m. at Paradise Ridge Winery in Santa Rosa, and the afternoon games at 4 p.m. at Windsor’s own Café Noto. The Paradise Ridge games require a ticket for entry, $15 per day or $45 for a four-day pass. A VIP pass is $225 per adult, and includes wine pourings, special access to the players and an invitation to the VIP dinner on June 10. 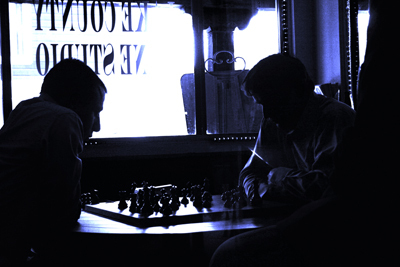 On Friday, the players will do an exhibition and play short blitz chess matches for fun. All games at Café Noto are free, and will be streamed online via a digital chessboard that records and archives each move the players make. The event is organized by Thomas Southerland, in partnership with the winery and café. “I’m a patron of the arts, if you will,” he said. The master player lent Southerland the book “My System” by Aron Nimzowitsch, and told him that after he read and studied it, he would play a match with him again. Within a year and a half he went on to study eight hours a day and beat different masters. Three of his games from the Chicago Open 1996 Championship were published in “Chess Life,” the official magazine of the US Chess Federation. “It quite literally consumed me,” he said. After covering the costs of the event, all remaining proceeds go directly to the Chess Club for Kids Scholarship Fund. Chess Club for Kids teaches chess to students in 50 schools in Sonoma County. GM Varuzhan Akobian dominated in his match against GM Yury Shulman, winning the rapids 3.5-2.5, and the blitz 6-2. The match was held at the Robinson Racheria resort in Northern California, a few hours from San Francisco. “I’ve never been on a farm before but I really liked it.” said the winner, Akobian. The Californian didn’t get to milk any cows, but he did enjoy driving a quad. The match featured a $10,000 prize fund–Organizer Thomas Southerland gives the full story. Check the official website for more links and photos. Many considered this to be a nearly even match-up of two of America’s strongest players, with a slight edge going to the U.S. Champion. So Akobian’s convincing victory came as a surprise to many. After GM Shulman’s arrival we began the trek to the site of the match and my family’s ranch where the players and I would be staying. At that point I was able to play some blitz with GM Shulman. Same time odds, though I didn’t fall as quickly as before while playing Var. I began to see that this match was going to be much closer than many had expected, In fact, I was thinking that Var seemed sharper on that day, and had a real chance to defeat GM Shulman in the match. Day one of play saw GM Akobian drawing first blood in a King’s Indian then securing a draw (The only draw out of 14 games!) in a Bogo-Indian. After the games we had a very nice lunch at the Tallman Hotel’s “Blue Wing Cafe” before heading back to the ranch where the players went over the games while I worked on getting our live broadcast up and running and ready for the next day’s games. Unfortunately after many hours working to establish the broadcast capabilities I was making no progress, So I decided to focus on providing the best coverage we could through ICC. Many thanks to the good people there for helping to bring the games to the online audience. The second day of the Rapid saw GM Shulman put a full point on the board with the Black side of the King’s Indian and GM Akobian taking the full point in round four in a Slav defense. After arriving at Susan Feiler’s Lake County Wine Studio for Fridays rounds of 5 and 6 I could tell that Var seemed to be doing what we used to call in tournament tennis in Florida; “Tree-ing”. This is basically when a player’s confidence and preperation come together in a display of rare precision. An expression of being far beyond the sum of the parts. Though GM Shulman wasn’t going down without a fight! Good food, good company, and great entertainment by Neon Napalm, Michael Barrish and Friends made celebrating our hero’s victory, (California’s strongest player) over the U.S. Champion in the Rapid Match a sweet moment. Of course we also celebrated the visit of our U.S. Champion and our highly esteemed chess journalist Macauley Peterson for gracing our hometown with their enthusiastic presence. The blitz match was very exciting for the spectators, GM Akobian was clearly on another level. It’s as if he were putting on a clinic in how to play blitz against a world-class opponent. Taking nothing away from GM Shulman, Var was was quite simply “On Fire!”. The result was a quick 6-2 victory. I’d like to personally thank both players for an outstanding showing of “Fighting Chess”. The boy rested his head on a picnic table overlooking a Santa Rosa vineyard Monday, his intense gaze now level with the chess board. No wonder. The boy’s opponent ­— Tigran L. Petrosian — is considered one of the world’s best players, having attained the title of grandmaster. Petrosian is in Santa Rosa this week to square off against fellow grandmaster Varuzhan Akobian in what is being billed as Sonoma County’s first invitational match featuring players of such caliber. Play between the two Armenian-born men begins this morning at Santa Rosa’s Paradise Ridge Winery, followed in the afternoon by another session at Cafe Noto in Windsor. The matches, which are open to the public, continue through Thursday. Prior to the start of competition, the grandmasters took time on Monday to play chess with more than two dozen kids from across Sonoma County. The event at Paradise Ridge was organized by Chess for Kids, which fosters love of the game in dozens of schools in Sonoma and Napa counties. Jolie Cook, the organization’s president, called it an “incredible opportunity,” comparing play against grandmasters to playing baseball with Buster Posey. “These are some of the best players in the world,” she said. Petrosian, who is named after the first Armenian to obtain the title of world champion, earned the right to take on current world champion, Norwegian Magnus Carlsen, in a June 23 match on Chess.com. Such matches are often marked by incredible tension. But Monday at Paradise Ridge, Petrosian appeared smiling and relaxed. He and Akobian squared off against 26 kids in a round of speed chess, the men going from one board to the next to make their next moves. The kids, most in grades K-6, sat at picnic tables beneath a large oak tree as an evening sun cast shadows across vineyards in the valley below. Katie Thomas, 9, a student at Strawberry Elementary School in Santa Rosa, said her dad taught her how to play chess last year. She said she enjoys the game because “you really have to think what the other person is doing.”Liam Morrison planned to use his patented “Liam Opening” against Petrosian, a series of moves involving a bishop and pawn to get to the grandmaster’s queen. It didn’t quite work out that way. Petrosian ended the match with the sixth-grader at Cali Calmecac Language Academy after about 45 minutes, much to the boy’s dismay. “I thought it would take longer,” Morrison said. After the matches, Akobian and Petrosian posed for photos and signed autographs. They also gave a lecture on a few chess moves. The two men most recently competed against one another at the Chicago Open in late May. In Sonoma County, they will play for pride and an undisclosed amount of prize money. The Paradise Ridge matches are being held at 10 a.m. today through Thursday. Admission is $15 and free for those 18 and under. The Cafe Noto matches in Windsor are at 4 p.m. and free to the public. Exhibition games also are scheduled for Friday. UPPER LAKE, Calif. – Lake County Wine Studio is continuing the weekly Thursday series of chess education and game playing. The games take place from 2 p.m. to 6:30 p.m.
Grandmaster-trained chess expert Thomas Southerland is the guest educator at this series. Southerland has written articles for the prestigious European Chess Web site, www.chessdom.com, and also for the Official U.S. 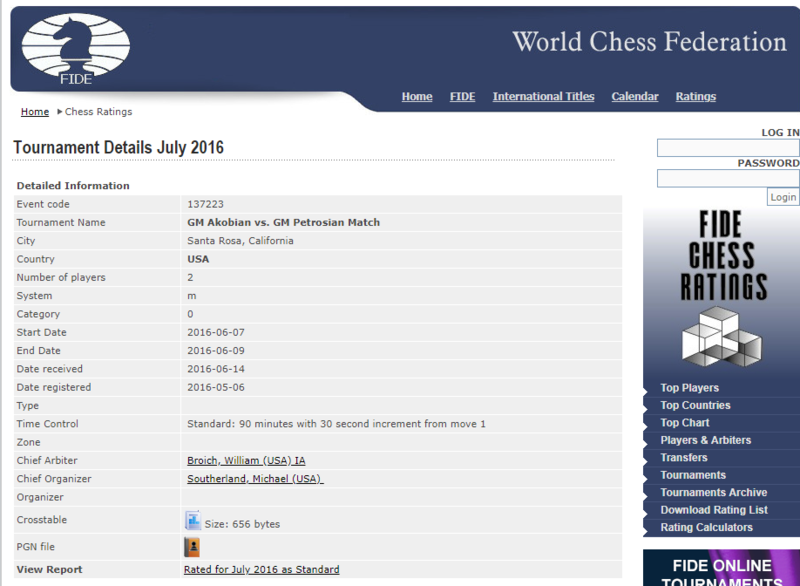 Chess Federation Website, http://uschess.org. Southerland had two games from the Chicago Open 1996 published in the official magazine of the USCF, “Chesslife,” for their brilliance according to Life Master Jerry Hanken. He also has organized and sponsored the first-ever Online Grand Master Chess Event at Internet Chess Club in 1996, and has remained active partners in organizing and promoting Grand Master Chess Events with ICC to this day. Southerland has interviewed for radio, Grandmasters Var Akobian, Yury Shulman (2008 U.S. Champion) and Israeli Grandmaster Victor Mikhalevski, and was promoted by Grandmaster Susan Polgar (Former Women’s World Champion) during his last event. 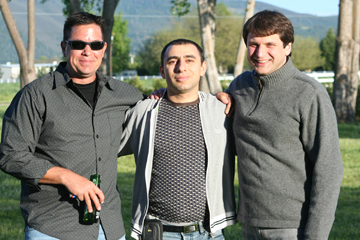 He organized the two-day multiple rapid chess matches between Grandmasters Var Akobian and Yury Shulman held in April 2009 at the Lake County Wine Studio and is currently working to organize his next major chess event to be held in beautiful Lake County in the early summer of 2011. Southerland offers insight into strategy fundamentals of end, middle and opening games to help players improve their games. Lake County Wine Studio is located on the corner of First and Main Streets in historic Upper Lake, across from the famous Tallman Hotel and Blue Wing Saloon. For more information, contact Susan Feiler at 707-275-8030 or 707-293-8752; susan@lakecountywinestudio.com.